See how Preston gets ready for bed. Wowza Preston, that is a really awesome trick! How did you learn how to do that?? My mommy and daddy are really impressed. I bet you get some pretty awesome treats for that move. I am not surprised in your talent Preston! You are too smart for words! I can already see you on the David Letterman show…or maybe you should audition to be an actor. I am so impressed! You are just too darn smart for words, Preston and too cute too! What a great way to help your Mommy! 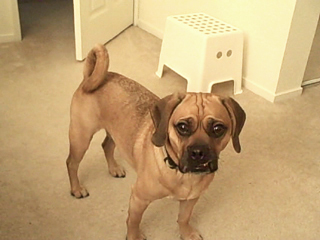 Your such a great puggle! Good boy Preston!!! I wish I could learn that someday but the switches here in my country are different from yours. It’s not easy to press them. And THEY say Border Collies are SMART !!! WOW !!! 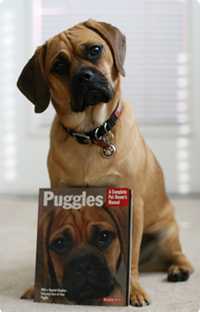 So proud to call you a Puggle Cousin !!!! Preston, you are so smart! Such a good little helper!! Your mommy must be so proud of you! Mommy shows people in her office your videos and they think you are the most amazing dog! Thanks for updating your link to my site! Preston, you’re so smart. We love your videos! You are so smart Preston!!!! !